The Dubai Health Authority (DHA) opened its second smart pharmacy on August 2, with a robot for dispensing medication. Last January, DHA had launched its first smart pharmacy at Rashid Hospital. This second one is in Dubai Hospital. The robot is one of the latest smart technologies adopted by the authority to meet the 2016/2021 strategy, which aims to achieve a happy and healthy society and transform Dubai into a leading healthcare destination by fostering innovative and integrated care models and enhancing community engagement. The robot can store up to 35,000 medicines and it can dispense around 12 prescriptions in less than one minute. The robot dispenses the prescribed medication with a click of a button based on a barcode, minimising any human error. The process is paper free as the robot will receive and store the prescription directly from electronic documentation done by the doctor. The robot is not replacing pharmacists. Rather it will allow the pharmacists to focus on providing the correct instruction to the customers on how to take the medication. His Excellency Humaid Al Qatami, Chairman of the Board and Director General of the DHA announced that the authority all DHA hospitals (DHA has four hospitals) will be adopting the robotic medicine dispensing system. The DHA is adopting a fully integrated smart system for its pharmaceutical services that include a barcode system in all its pharmaceutical transactions in DHA hospitals and health centers. The authority is implementing the new system in coordination with the biggest international companies that supply medication. 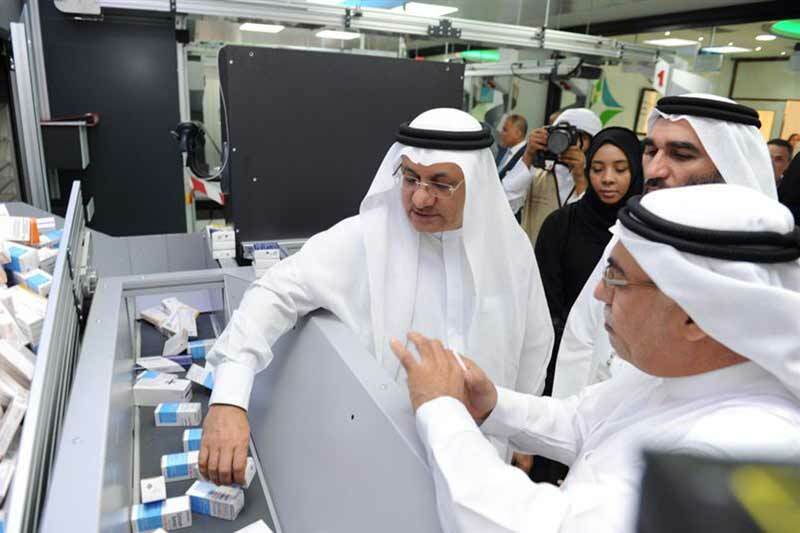 Al Qutami also noted that DHA recently adopted a smart system that monitors and tracks the temperatures of medication throughout the cold chain of pharmaceuticals, ensuring that the quality, safety and effectiveness of medication is maintained. Monitoring the cold chain to ensure that pharmaceuticals reach patients safely is on the biggest challenges faced by health organisations around the world.